Sterling silver filigree earrings, "Lunar Auras"
Giuliana Valz-Gen celebrates Catacos' historic filigree art with the design of these earrings. The earrings are crafted by hand with sterling silver. 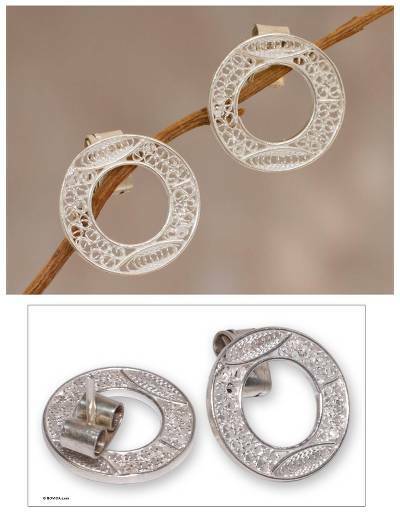 You can find sterling silver filigree earrings 'Lunar Auras' by Giuliana Valz-Gen in jewelry categories such as No Stone Earrings, Silver Earrings, Sterling Silver Earrings, Button Earrings and Filigree Earrings. Enjoy exploring these sections for other Novica treasures.